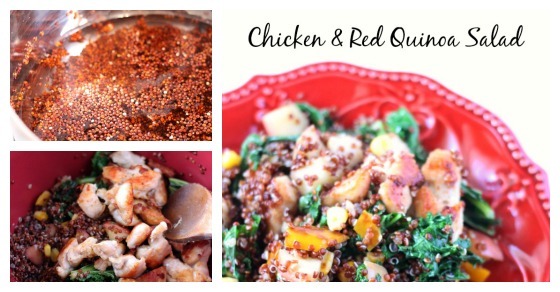 Home » Recipes » Lunch Ideas » Healthy Chicken and Red Quinoa Salad – Delicious Hot or Cold! One of our family’s goals this year is to eat healthier, and something that has made that easier has been involving the kids in helping prepare healthy snacks and meals. They like the challenge and are more likely to eat the healthy option if they’ve made it themselves. An Easy Quinoa Salad Recipe the Kids Can Help Make! This Chicken and Red Quinoa Salad is an easy recipe the kids can help make and is delicious served hot or cold, too. Jump to the Full Recipe! Red quinoa has been a huge find for our family this year – it is a complete source of protein, a grain, and adds a chewy, nutty element to any dish. 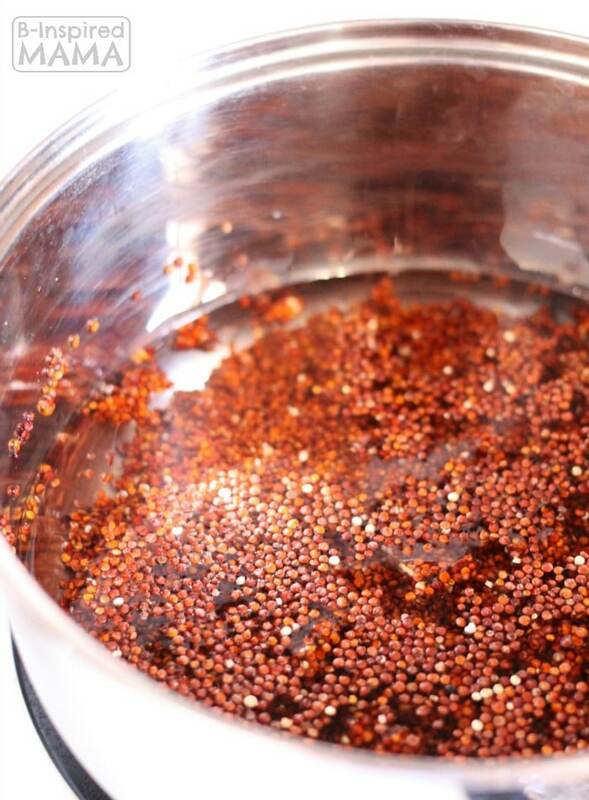 It has the same health benefits as Golden Quinoa but is such a bright and beautiful color. It’s also incredibly easy to prepare – I don’t know what took me so long to get on the quinoa train! I love serving this salad hot and then saving cold leftovers for lunches the next day. Swap out the vegetables or add a small amount of dressing for a completely new salad each time. 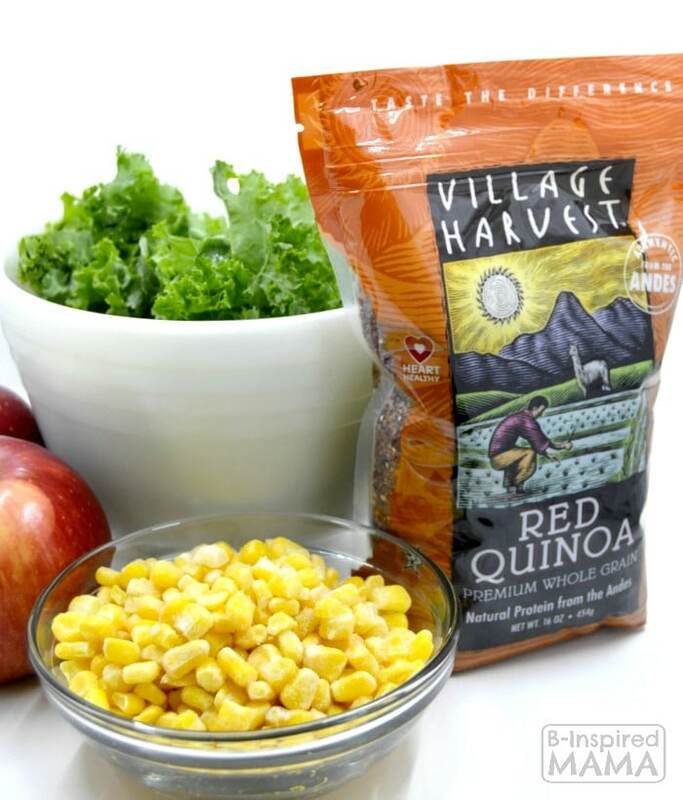 We use Village Harvest Red Quinoa because all of their grains are natural and unprocessed. The company also supports some wonderful global initiatives, so I feel good about supporting them, too. They have other natural and unprocessed rice and grain options, too; from Golden Quinoa to Arborio to Black Rice and more! To make the salad, I first follow the package directions to get the quinoa started on the stove. Isn’t the color beautiful?! to allow them to help cut up the apples. By the time the kids and I are done with the vegetables, the oil is usually hot enough for me to add them to the pan. Once the quinoa comes to a boil, I give it a single stir, place a lid on it and remove from heat. The quinoa absorbs the water and finishes cooking in only about 5-7 minutes while you pull together the rest of the salad. 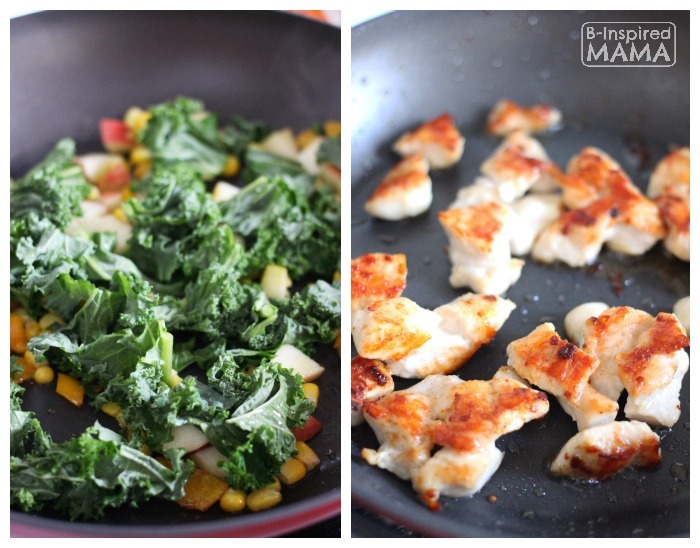 Once the kale is wilted and the apple and corn are nicely browned, I set the veggies and fruit aside in your serving dish and add a bit more oil to our frying pan for the chicken. The chicken only takes about 5-7 minutes to cook through. It should be completely white when cut open (with no pink) and have a nice golden color on the outside. works perfectly with the red quinoa. Looking for a healthy recipe easy enough for the kids to help make? 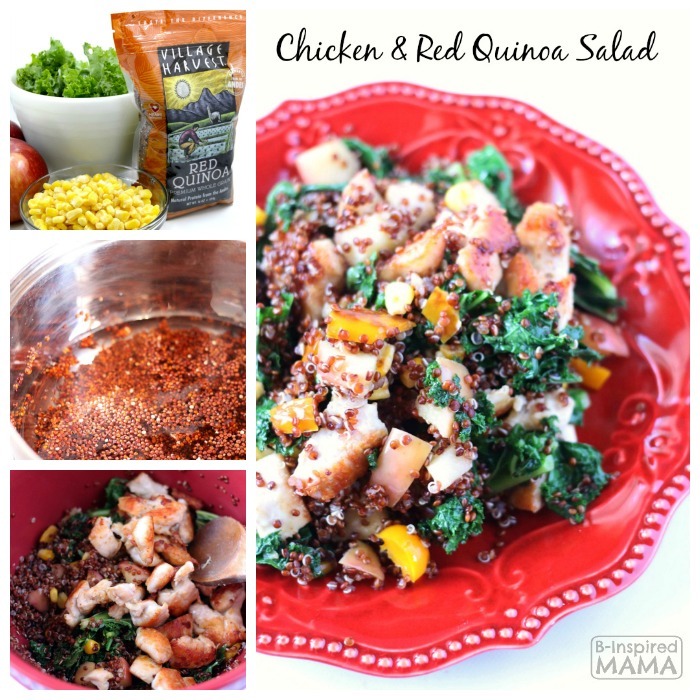 Try this easy Chicken & Red Quinoa Salad - delicious hot or cold! Add chicken to pan and saute until cooked through (to an internal temperature of 165 degrees Fahrenheit). 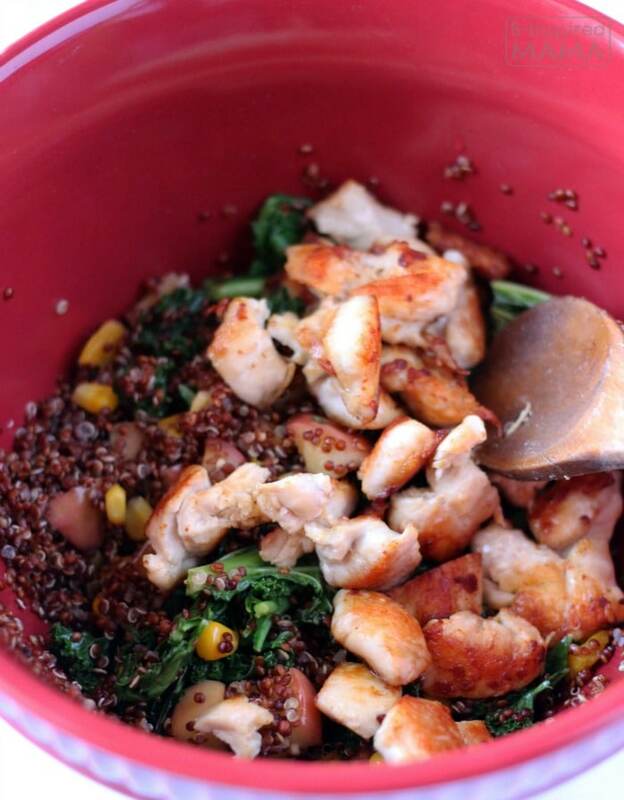 Combine prepared Red Quinoa, vegetable/fruit mixture, and chicken in a serving bowl. Do you enjoy cooking with quinoa? 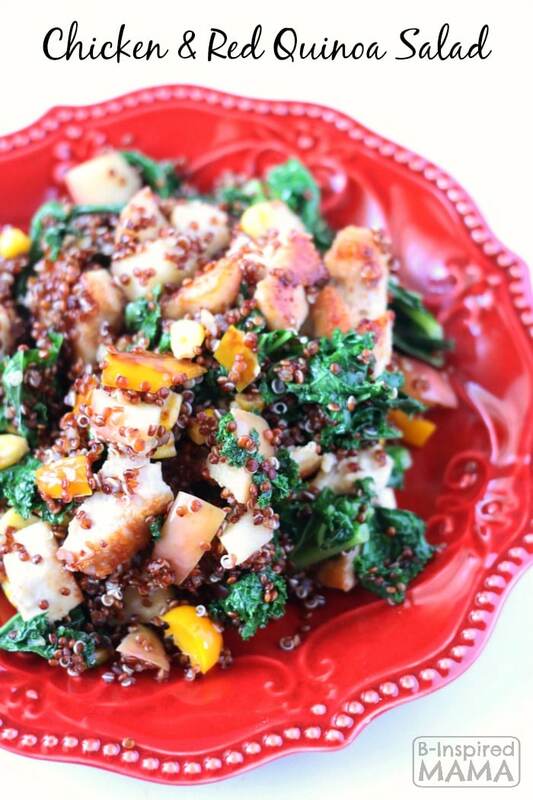 Do you think your kids would like to help with this quinoa salad? Join the conversation in the comments below! Silly Star Pasta Salad – the Kids Will Love!